And now we settle in for the long haul. If you’re like me and were wowed by last week’s debut, “Riverbrook” feels a bit like the final shots of The Candidate or The Graduate: Something exciting and momentous has happened, but where do we go from here? For Graham Yost and his writers, that means setting aside the Elmore Leonard crutches—“Pilot” covered Leonard’s story “Fire In The Hole”—and learning to walk on their own. So the second episode is a crucial indicator: How adequately can the show imitate Leonard when it can no longer adapt him? How will the overarching story move (or not) toward the indefinite horizon of an open-ended television run? What kind of show is this going to be, anyway? I’ll confess to feeling a bit of a letdown this week as Justified transitioned from the arresting, near-perfect pilot to the more workmanlike, nuts-and-bolts—albeit satisfying—cop show that it became this week. I think it’s reasonable to expect the writers to balance self-contained episodes like “Riverbrook” with more serialized hours, but Week Two strikes me as the wrong time to slow down. 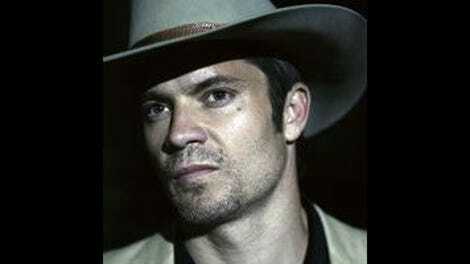 There are so many lingering questions about Raylan, his past, his relationships with various Kentuckians old and new, and the fallout over his back-to-back shootings that I’d have been happier if the show had not thrown on the brakes and punted so many of those issues down the road. Nevertheless, this is a marathon, not a sprint, and “Riverbrook” proved the show could settle just fine into a week-to-week groove. Turns out Cooper hid the loot under the floorboards of a house in development and wants to stop his stripper ex-wife and her new beau/relation (“it ain’t like we’re first cousins”) from getting there first. The three enter into a tense arrangement: The ex’s boyfriend knows a thing or two about disarming burglar alarms, which he’ll do if Cooper shares a cut of the money. And since none of the three are “honor among thieves” type, we’re really just waiting for things to unravel. 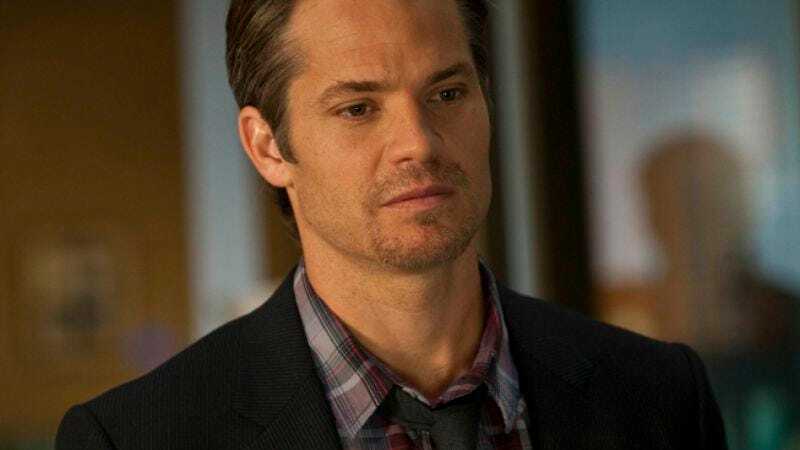 “Riverbrook” has a plot that’s more or less boilerplate cop show stuff, elevated by many of the elements that made the pilot so distinctive—a great sense of local color, Olyphant’s tremendous charisma as Raylan, and lots of flavorful dialogue. Yost, who scripted this week’s episode as well as the pilot, doesn’t strain to outdo Leonard, but he has the voice down cold, and he fires off some sharp colloquialisms and one-liners. For now, I guess we’ll just have to let the show inch along at its own pace. • Still more inference about Raylan’s father Arlo. At some point very soon, the writers are going to stop suggesting and start revealing.